Pioneering Integrated Community Sustainability Planning (ICSP) efforts have engaged citizens and community stakeholders in a dialogue on the sustainable future of their community, where sustainability is achieved not through a variety of discrete actions in diverse sectors, but rather by finding integrated approaches that produce multiple impacts and benefits. The Natural Step believes that transformational change at the community level is the most effective way to foster change toward sustainability overall. 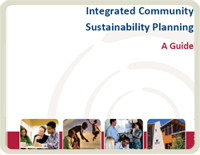 The purpose of this guide is to help you lead a community through a transformational change process through the development of an Integrated Community Sustainability Plan. As such, the guidebook shares lessons learned, tools, case studies, and other resources to support the process.